Sheet vinyl flooring, which is often referred to as resilient flooring, is a rolled-goods flooring traditionally available in widths of 6’, 12’, or 13’2”, and is available for residential or commercial use. Sheet vinyl performs well in high traffic areas while maintaining its beauty for many years. Still one of the better values in flooring, sheet vinyl offers a variety of patterns and colors from entry-level builder-grade to high-end premium quality products. All sheet vinyl products are treated with a wear layer, which also comes in different grades and materials. In most cases, the no-wax wear layer makes for easy maintenance and care without the need for waxing or polishing. One-piece sheet vinyl minimizes the need for seams, creating a smoother look. It is often found in kitchens, bathrooms, operating rooms, exam rooms and other higher-moisture areas. The beauty, durability and convenience of a one-piece installation has helped sheet vinyl to remain one of the most popular choices in the resilient market. In loose lay installation, the flooring is installed without the use of glue. The flooring is cut into place and lays flat on the subfloor. Most fiberglass or flex back sheet vinyl can be installed using the loose lay method as long as there are little to no seams needed. 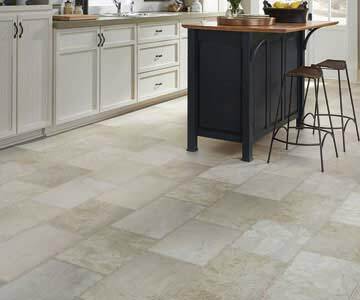 Most loose lay floors require some expansion and contraction space around the perimeter of the installation area. Full spread installation, often called glue-down installation, is a process in which the entire floor is glued directly to the subfloor. You must have a clean and level subfloor free of holes, gaps, imperfections, nails and staple heads. The installer will trowel on the proper adhesive, giving the floor a permanent glue-down installation. The basic construction of sheet vinyl from top to bottom is a top coat, wear layer, pattern layer, cushion layer, fiberglass (keeps the floor laying flat), & base layer to support all other layers. Whichever type of sheet vinyl you choose to install, we recommend consulting with our professional sales and installation team to give you the proper information and guide you through product selection.